The Revolutionary Army’s Chief of Staff. Grew up with Ace and Luffy, and swore an oath of brotherhood with them. 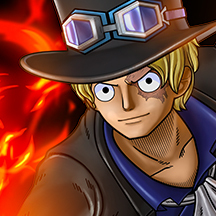 In the Corrida Colosseum tournament in Dressrosa he defeated the other participants to win the prize, the Logia “Flame-Flame Fruit,” and then succeeded the abilities of Ace.